There continues to be an ongoing heated debate about vaccinations. Many studies suggest that vaccinating kids leads to autism, while doctors insist that as parents we must vaccinate our children according to a set schedule to prevent any harmful and serious illnesses for which there is no cure. 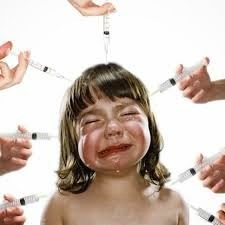 Furthermore, many claim that vaccines given to children contain low or high amounts of mercury. Although I was recently advised by our pediatrician that vaccinations in Canada do not contain any mercury, this matter remains somewhat questionable to me. As a parent I still hesitate to vaccinate my kids against certain illnesses, especially while they're still infants and their immune system is not developed at all. And, is it really safe and wise to inject a needle into a 2-month old baby containing 3-5 different viruses? If it were up to my husband, we wouldn't vaccinate our kids at all. I'm, on the other hand, believe in classic medicine, having my grandma who is a doctor, it's hard not to. With our boys, we vaccinated them according to the set schedule, except for chicken pox. My husband won the battle on that one, arguing that it would be much better for our son to get sick with chicken pox as a child than getting the vaccine. But when our daughter was born about 2 months ago, both boys got the vaccine to prevent any potential illnesses in the house with a tiny baby. 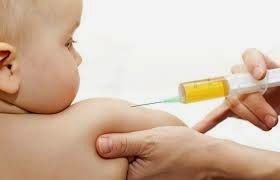 According to VRAN (Vaccination Risk Awareness Network), the Canadian public health authorities recommend an average of 36 vaccination doses, containing 13-16 different vaccines for the first 18 months. And by age 12, children are advised to get 54 vaccine doses. Isn't that insane? Over the last 2 decades, there has been a significant increase in cases of autism, ADHD (Attention Deficit Hyperactivity Disorder), learning disabilities, ear infections, all types of allergies, asthma, and many others. Doctors insist that vaccinations prevent many serious and life-threatening diseases, but at what expense? 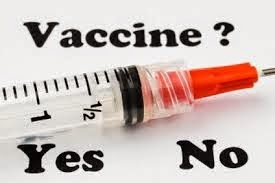 I don't believe there is conclusive evidence linking vaccinations to autism, ADHD, allergies, and so on; however, there are more and more studies and cases showing that unvaccinated children have less allergies, ear infections, ADHD, colds and other illnesses. "For the first time in history... children are sicker than the generation before them. They're not just a little worse off, they are precipitously worse off, physically, emotionally, educationally, and developmentally. ", adds Judy Converse, MPH, RD, a licensed registered dietitian specializing in medical nutrition therapies for children with developmental, growth, learning, behaviour and allergy problems. And apparently, the problems are more common in boys than girls. So, why pediatricians continue to deny to negative effects of vaccines, and insist on sticking to the public health vaccination schedule? And, why do parents continue to support pediatricians? I can't tell you how many times I've been to the doctor's office with my kids when they're sick (and so have you, I'm sure), and the usual response I get from our pediatrician is "There is nothing to do, just wait until it goes away, it's just a virus. Put on the humidifier". It is very frustrating, and you often wonder if these doctors really know what they're doing. I don't find much quality in our health care providers. We get about 3 minutes a visit, more often than not the doctor makes fun of my unusual questions and worries, rather than listening to the problems at stake, and not putting any effort at all interpreting my kids' growth, but rather adding a dot to his/her growth chart instead. What is the point of continuing down this road? And what options do we have as parents? I believe these are the very reasons (mentioned above) why many parents turn to alternative medicine. With our daughter (who is just over 2 months old), we decided to wait on the vaccinations. If you're breast feeding, your baby should be immune to whatever you're immune as a mother. We are planning to start the vaccinations at 4 or 6 months, instead of 2, and may not do all of them according to the recommended schedule. But, the more I read about the possible consequences of vaccine doses, I wonder if they're worth the risk. By the way, vaccination for school entry is NOT mandatory in Canada.